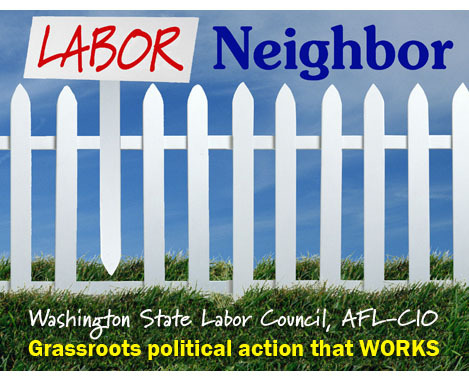 Labor Neighbor, the Washington State Labor Council’s grassroots member-to-member political action program, engages union members to inform fellow union members and their families about the candidates and ballot measures that have earned labor’s endorsement — and why they earned it. 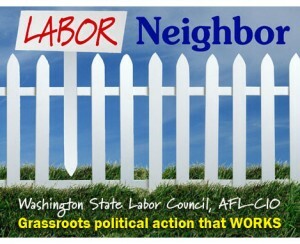 UNION VOLUNTEERS ARE NEEDED for neighborhood walks, phone banks, and other Labor Neighbor efforts. Even if you live outside the districts listed below, you can help in that area and/or phone banks. Check the schedule and fill out the Labor Neighbor Volunteer Form (below), or call 206-281-8901 for more information. PHONE BANKS — Weekly phone banks on Tuesdays and Wednesdays through Election Day at the Machinists 751 Hall, 9135 15th Pl. S. in Seattle, with shifts from 4 to 6 p.m. and from 6 to 8 p.m. each night. Download the phone bank schedule. For more information or to RSVP, email the WSLC’s Cherika Carter or call her at 206-384-1133.